Craig Romano, guidebook author, talks about the benefits of the popularity of Mount Si - despite the crowds. No, I am not talking about whether you consider yourself a liberal or conservative. I’m talking about whether you've hiked Mount Si or not. Mention Si to your fellow Mountaineers and hikers and you’re sure to get an earful. While Si ranks as one of the most hiked mountains in the state — some estimates are up to 100,000 hikers a year — it’s not necessarily the most loved. Folks either love it or hate it. Si’s not like other popular hiking destinations. Nobody hates Mount Rainier, Mount Constitution, or Mount Ellinor! So, what’s up with Si? When I first moved to Washington in the summer of 1989, I certainly was in no hurry to hike it. Why would I be when there were so many better, less-crowded, and more beautiful places to hike that weren't much farther away than North Bend's iconic mountain? I’d drive by Si and look up at that blocky mass shrouded in second growth and surrounded by clearcuts and think, "What can be the appeal? And what can be the attraction with all of those people up there? Nope, not interested. I’m off to the Teanaway or deep into the Alpine Lakes Wilderness instead!" Alas, summer faded to fall and fall transitioned to winter and I found most of my preferable hiking haunts now inaccessible. On a beautiful Tuesday in December (we get them occasionally) I found myself in the Mount Si parking lot! There were about a dozen cars in it. "I can handle that," I thought — and off I went. Yes, the forest was scrappy. Yes, the climb was steep and challenging. And when I got to the summit block, the view wasn’t bad at all. In fact, it was pretty cool. The clear cut peaks to the south were nothing to write home about — but Mount Rainier rising above them, the Olympics forming a snowy wall in the west, and the green (it was much greener in 1989) Snoqualmie Valley below yielding to the skyscrapers of Seattle was indeed a sight to behold. And it was December, and I was standing on a 4,000 foot mountain that was snow-free. Can’t do that in my home state of New Hampshire! Can’t stand on snow-free mountains in December in most parts of the country, actually. Next, I scrambled up the Haystack. It had my 28-year old heart pounding. Nice little challenge and I had the whole summit to myself. I took some photos and headed back down as sunset was on its way. I had to admit, Si wasn’t half bad. But I probably wouldn’t be heading up it again anytime soon. There were far too many other mountains I’d rather be hiking. As time marched on, I witnessed an explosion of people taking to Si. I read the trip reports — then just noted the trip reports — then ignored them outright. Just how many reports do we need on this mountain? What can Mount Si Hiker number 52,000 for the year possibly tell us that we don’t know already? Some of the reports bemoaned the mountain’s elevation gain. Some reports were by braggarts proclaiming their record times up it with full packs. Other reports were from reckless youths, macho group leaders — you name it. People had strong opinions about this mountain in their reports, too. Some ranted that they didn’t get a wilderness experience! Seriously? A mountain in a county of two million people located 30 miles from the downtown of a major US city with paved road access just a couple of miles from an interstate highway and you were expecting to be alone?! No, Mount Si is what it is. But, just what exactly is it? It was time for a return trip so that I could truly answer that question. So this spring after a nearly 25-year hiatus, I left my home in Skagit County (not Seattle, so I actually had to travel a distance to get here this time) to hike Mount Si once again. Preparing myself to be bombarded with people and behavior that I am not usually accustomed to on the trail, I made a pact with myself to just go with it. Yes, I heard the bad reports about all the loose dogs, loose frat boys, and yahoos on the loose. I expected to encounter scads of Mountain Dew cans and bags of doggie doo littering the trail. I got to the mammoth parking lot and took a deep breath, and prepared myself for a type of hike that I haven’t experienced since hiking New Hampshire’s Mount Monadnock and California’s Yosemite Valley. It was a beautiful Tuesday in April and there were already over 50 vehicles in the parking lot. I counted them — and then as I began up the nicely built trail (much better than the one I hiked in 1989), I decided to do some more counting and observing — and see for myself just how many people do hike this mountain on any given day. And what are they really like? I grabbed my notebook and pen and started up the path. I decided that in addition to actually counting every person I encountered on the trail, I was going to greet them all (yes, and that turned out to be more tiring than the elevation gain) and see how they reacted. Were they hurried and unfriendly or nice? Would they say hi back to me, chat, or give me that famous city greeting, eyes averted to the side like you don’t exist. I would also take note of whether they were prepared. Did they at least have a small pack, water, some provisions? Or were they hiking in skimpy running shorts, armed with only an empty Dasani bottle? I also took notes on their dogs. Were they leashed, under control, or chasing young children up trees? And did folks leave their dog's droppings along the trail? How about trash? I started my hike at 11:45am. I made a diversion on the Talus Loop Trail, and spent 2.5 hours on the summit, including a hike along the Teneriffe Connector. I returned to my vehicle just before 6pm. Here’s what I have to report: On the way up, I encountered 44 people, of whom I deemed 37 friendly, returning greetings and eye contact. I encountered four dogs on leash and four dogs off leash and all of them were well-behaved and in control. Only saw two poop bags along the trail (two too many — but I was expecting much more) and very little trash. On my way down, I encountered 87 folks, three leashed dogs and two unleashed dogs, and all of the dogs were well-behaved. Mind you, I missed counting people when I was on the 1.3 mile Talus Loop, in which I only encountered two hikers. And while on the Teneriffe Connector, I encountered no one — which leads to my first conclusion — you can still be alone on this popular mountain. But here’s what else I’ve come to conclude. The folks hiking Mount Si come from all walks of life. There was a broad spectrum of ethnic, socio-economic and generational diversity on that mountain that day. Earlier in the day, it was mainly boomers. Later in the day, primarily young adults. But I also encountered families. I encountered newbies that were over- packed and newbies with no packs at all, folks running and folks plodding, folks plugged in and tuned out and folks tuned into the surroundings. There was a shared experience on the moutain, a sense a sense of accomplishment shared by all who made it to the top. Si is a social mountain like much of the Appalachian Trail. If you can accept that, you can enjoy Si. We need Mount Si for several reasons. It's a gateway mountain for many folks, introducing them to the wonders of hiking. It's a familiar friend for many, allowing a close-to-home big mountain hiking experience. It's a mountain that siphons folks away from other trails so that you and I can enjoy them without the crowds. It’s good to have these popular peaks attracting people. All of those Si hikers are supporting our trails through pass purchases, bonding with the outdoors and hopefully getting involved by joining groups like The Mountaineers and Washington Trails Association (WTA). And you know something? Si is not an easy hike, so to have so many folks attempt it in this day and age of rampant obesity and sedentary lifestyles is a good thing. We need Mount Si and its like to help us fight the ills of society — even if a few of those ills occasionally creep on to Si. But we can address them if they do. 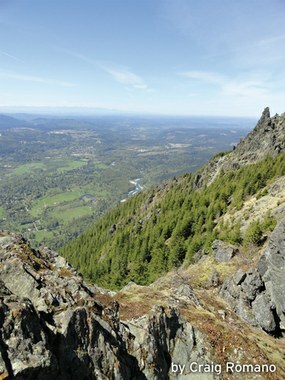 Mount Si could have ambassadors on it. Mountaineers, WTA members and other hikers could meet inexperienced folks and familiarize them with hiking, trails, healthy lifestyles, and leave no trace ethics. And perhaps, help these folks become hiking and trail ambassadors themselves and pay it forward. So love it or hate it, Si is not a bad little mountain. And you know what else? The views are pretty darn good, no matter how many people you’re sharing them with. This article originally appeared in our July/August 2014 issue of Mountaineer magazine. To view the original article in magazine form and read more stories from our bi-monthly publication, click here.